On a cold wintry December night (first snowfall of the season, I do believe), six guys showed up to play squash, while another forty or so, showed up to watch. This was originally meant to be an away match for the Printing House, but as the PH courts are due to be closed on Dec. 15th, the gang from Street Squash agreed to head on down to the West Village, and do battle one last time. I’m not sure I could have scripted a more fitting tribute to Court B in particular (always was my favorite), or Printing House squash in general. These were the two best teams in the league facing off (Street Squash was ranked #1 coming into the match, Printing House #2), featuring the two best players in the league. Both teams had brought along some supporters, and I could swear I saw what looked like cans of Heineken and various bags of chips making their way through the crowd. 3rd String Match: Steven Baker was tough, determined, and simply too wise and experienced for a clearly fit and very skilled opponent. And if Will Cheng has a dream backhand, then Steven’s forehand is equally smooth and velvety! All kidding aside, it was cool to watch as Steven dealt with his lack of oxygen issues in the second game (he lost the first game in overtime, won the second in overtime), concentrate on not making errors, and patiently wait, while his younger (or does it really matter when they’re both under 25??!! ), fitter opponent grew frustrated and made errors. A well executed match by Mr. Baker, and another win in the bag for a thus far flawless season. And a brief aside to Mr. David Hughes, yes I do know all the words to O Flower of Scotland, I’m just not sure it would have helped Steven in the middle of his match! 2nd String Match: I’ve seen this before; Will Cheng starts out a bit rusty, he makes a few uncharacteristic tins, he gets himself down 10-6 down in the first game….and then he decides to switch gears! As I said to him afterwards, “can’t you just lose that first game, and win in 4??! !”, but Will was having none of it. He clawed his way back to 10-10, and methodically went on to win the first game. Like I said, I’ve seen it before. It sets a pretty harsh, yet simple message: “I am not going to lose this match, and there’s nothing you can do about it”. Tony retrieved like his life depended on it, and made some amazing “gets”, but he simply spent too much time scrambling around the court, digging the ball out of various corners, while Will controlled the T. Those initial tins of Will’s became deadly accurate drop shots, particularly on the backhand side, often nicking and leaving his opponent with no response. 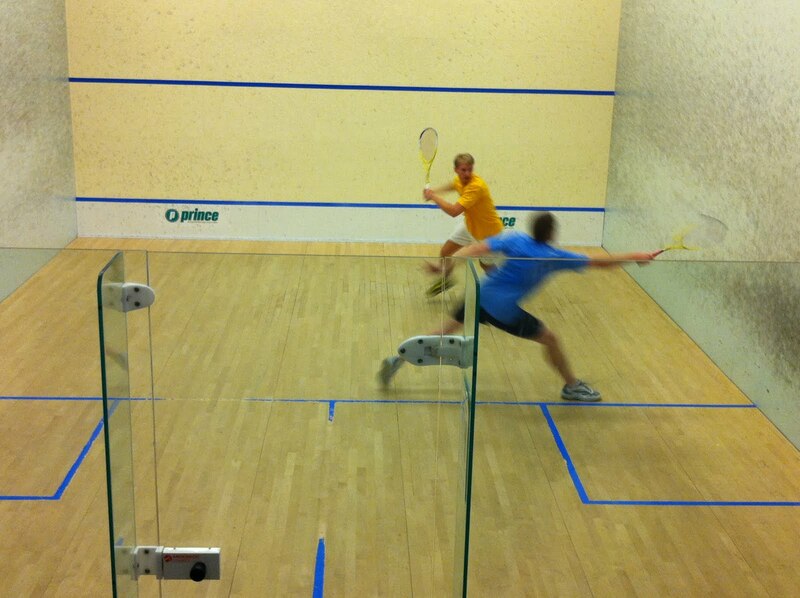 It’s always an honor and a pleasure to watch Will play squash, and I could sense the rest of the crowd felt the same. Congrats Captain! While I hate to agree with such pronouncements, I think the informer might have been right; this was seriously high level squash. Both players kept the ball tight and deep, while Jacques surprised Gustav a couple of times with a hardball type front wall boast that collected him a couple of points. But there was something about Gustav, much like Will the match before, that sent the “I-will-not-yield” message. On several occasions he almost willingly went along with the court sprint drills that Jacques set up for him, running relentlessly from corner to corner, retrieving stuff that truly looked irretrievable (to gasps by the crowd), and just generally keeping the ball in play. He’s a study in mental fortitude, simply shrugging when the occasional let/stroke call did not go his way, and calmly setting up for the next point. I don’t know if it’s how they’re made in Sweden (Borg, Edberg and Willander all come to mind), but that calm and relative lack of emotion can be seriously disconcerting to any opponent. I think I heard him mutter ‘skit!’ once to himself when he tinned a drop shot, but that was it. Inspirational stuff! So inspiring, in fact, that young Jake Ellen quit watching mid-match, and ran off to hit by himself on a nearby court! Final result: 3-1 to Gustav amid much applause and some hollering by a very engaged crowd. I’m going to miss it. A lot. So I will sign off this match report simply stating that I sincerely hope we can recreate that somewhere else. I’m not particularly patient, but for that, well, I’m willing to wait for quite some time…..